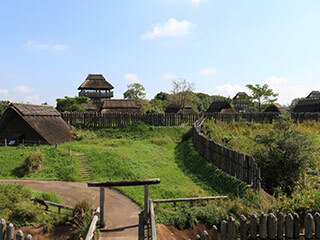 Yoshinogari Archaeological Site (吉野ヶ里遺跡) is one of the largest historical remains in Japan. It is the ruins of the Settlements of Yayoi Period (500 B.C.E. to 300 A.C.E.). There are restored houses and buildings based on the excavations surveys conductes so far, they are working a reconstruction project which is set in the later half of the Yoshinogari Period (around 300 B.C.E.) when the settlement reached its peak. Today, it's open as the historical park that you can walk around Japan of the 2000 years ago. Admission: 420 Yen for Adults, 80 Yen for under 15, and 200 Yen for Seniors. There is free lotation bus in the park. 1. use JR Nagasaki Line to Kanzaki Station.